Do you have an animal lover at home? Are you thinking of an innovative way to teach your child about wildlife? Then why don’t you try our cute raccoon coloring pages? Raccoons, with their unique fur patterns, are cute creatures of the wild. These adaptable animals are native to North and South America and tropical islands. Raccoons can live in a variety of habitats like the forests, cities, suburbs, marshes and prairies. These adorable, nocturnal animals have a lifespan of 6 years in the wild and almost 20 years in captivity. Here are ten easy to print raccoon coloring pictures. It features both realistic and fun cartoon diagrams of raccoons. Have a look! Say hello to this charming raccoon! He looks a bit sneaky in the coloring. We wonder what he is trying to hide. Can your child help us find out by coloring the image? 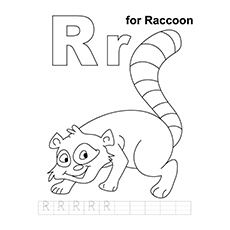 Your preschooler will get a fun introduction to the letter R as he traces the uppercase and lowercase R and colors the mischievous raccoon. 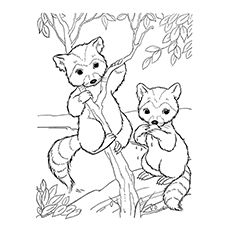 Here is a color by instruction raccoon coloring page for younger children. It states that raccoons have great fun climbing trees. Raccoons have black patches around the eyes that look like masks, as you can see in the diagram. They have clawed feet, pointed snout and black-ringed tail. 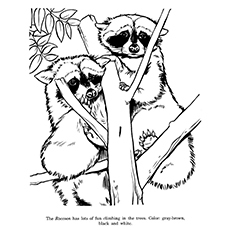 Ask your child to use gray, brown, black and white for coloring this raccoon. The Eastern raccoons are native to Canada and Nova Scotia. Just like most of the raccoons, the Eastern Raccoons are also omnivores. They can eat almost anything and everything like birds, mice, frogs, crayfish, garbage, and plants. They find much of their food in the water itself. Here is a cute baby raccoon pictures to color which is climbing a tree. Newborn raccoons do not have black patches around the eyes or a ringed tail. They develop these after a few days. But bobcats and wolves often eat these cute little creatures. Adult raccoons go to great length to protect their offspring from these threats. Here is a coloring sheet of a pair of Chesapeake Bay Raccoon. You will find them in the coastal marshes of Delaware and Maryland. The Chesapeake Bay Raccoon grows up to be 46 to 66 centimeters in height, with the tail growing up to 30 centimeters long. The long toes and fingers of this raccoon have an acute sense of touch. We have a musician amongst ourselves, and it’s none other than Mr. Raccoon. 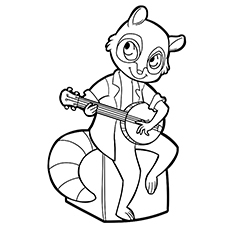 Our Mr. Raccoon is an exceptional banjo player and is aspiring to become a sensational national banjo player. But he looks a bit dull right now in this black and white image. Tell your child to take out his coloring set and paint Mr. Raccoon in some happy colors. The article is full of aspiring musicians. Now that you know Mr. Raccoon, it’s time to meet Ricky, the Drummer. Just like Mr. Raccoon, Ricky also wants to carve a niche for himself in the music industry. He practices drumming at least 12 hours a day, just as he is doing in the coloring image. Tell your child to encourage him by giving him some vibrant colors. Meet the magnificent Rocket Raccoon, a member of the “Guardians of the Galaxy”. The intelligent fellow is a master tactician and an expert shooter. He gets enraged when people do not give him equal respect as they would give a common rodent. Rocket Raccoon is a genetically engineered character and always appears in his orange battle suit. 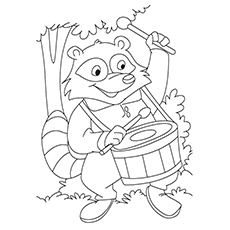 The cute raccoon coloring sheet you see here is Meeko, the tritagonist from Disney’s film “Pocahontas”. Meeko is Pocahontas’s pet. He is a sly and greedy raccoon who loves to steal food, especially John Smith’s biscuits. 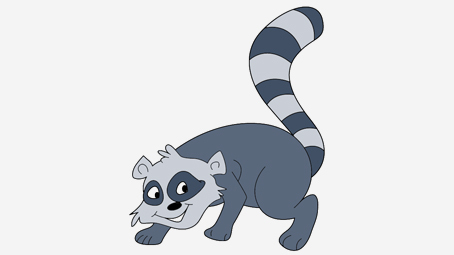 Meeko is a slender and gray colored raccoon with black limbs, white face and a bushy tail and gray and black stripes. These tiny little raccoons are tired of playing and are now taking a rest. 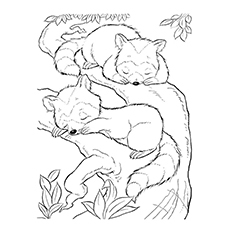 Tell your child to fill colors in this serene picture before these raccoons get up. Raccoon Cubs are quite mischievous. They can even play day and night if their moms allowed them. 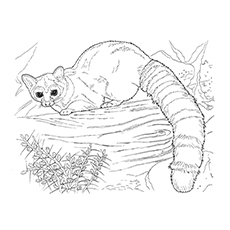 Our coloring pages will help your child learn about the fascinating mammal while having fun with their watercolors and crayons. 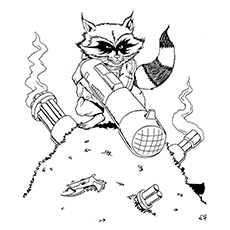 Children can also use our free raccoon coloring pages in their science projects. 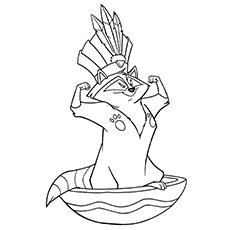 So download these raccoon coloring pages right away.